For reasons I can't figure out, probably something or other having to do with publishing business absurdities, ISLAND OF BONES, the third book in the British series was published here AFTER the fourth book, CIRCLE OF SHADOWS. I refuse to read this series out of order (though you, of course, are free to do so) and so I've waited almost six months (probably longer) for ISLAND OF BONES to become available to me. If you've read my previous reviews of Imogen Robertson's books you know how much I love them and how enthusiastically I recommend this series even if you're not, normally, a fan of historical mysteries. The books' setting is unusual to begin with, England in the 1700's - the era of powdered wigs and robes a l'Anglaise. Imagine CSI, 18th century and you get a glimmer of what our two protagonists are up to. These two main characters are enormously interesting and grow in noticeable ways from book to book as does our interest in them. Mrs. Harriet Westerman is an atypical Englishwoman, she is interested in science, in mystery-solving, in intelligent discussion of non-household-related minutia. She is, in certain ways, an anomaly, a stranger to her family who are often bemused if not downright angry with her 'eccentricities'. Luckily for her, Mrs. Westerman is wealthy enough not to care what society thinks or even, really, what her family does. Though occasionally she is torn with indecision since she is the mother of two young children and you know how that goes. But she has a deep intelligence and basic need to know and she means to use these God-given talents no matter what. Mrs. Westerman works alongside forensic scientist Gabriel Crowther, a reclusive mystery man more at ease with a microscope (of the time) and a dead body, than around live human beings. It is due to Mrs. Westerman's first having sought Crowther's help when she stumbled across a dead body on the edge of her country property (book one, INSTRUMENTS OF DARKNESS), that the two have become a rather unconventional working partnership. The aloof Crowther would have been just as happy staying in the shadows, puttering about his home laboratory. At any rate, ISLAND OF BONES finally reveals a great deal of the background of mystery man, Gabriel Crowther aka the Baron of Keswick, a peerage awarded to his murdered father years ago - a peerage whose title Crowther has vehemently rejected. We've had hints all along about why Crowther is the way he is, but here finally the truth is revealed at last and a man hanged for murder years before, is vindicated. Crowther and Mrs. Westerman are invited to visit Cumbria, when one body too many is found in an old grave meant only for one. 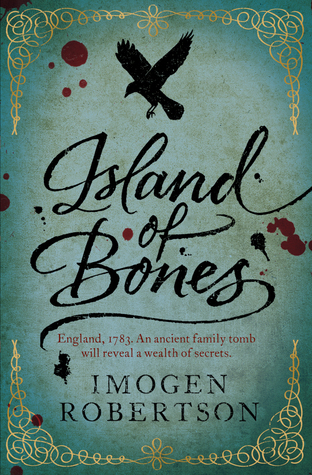 The grave is on an island near an old ruin, part of the estate which once belonged to Crowther's father and is now owned by a Mr. Briggs who is away on business, leaving his charming wife to run things. Turns out that Crowther's estranged sister and her grown son are guests of Mrs. Briggs (coincidentally) and it is the sister who suggests bringing in Crowther to investigate their mysterious pile of bones. "An extra body? What do you mean, an extra body?" "Perhaps we should summon my brother Charles," the vizegrafin said quietly, then, as she found the others looking at her: "You know he has become quite renowned at ferreting all sorts of information from a body. It might interest him. Will you be so kind as to invite him, Mrs. Briggs?" Altogether another wonderful entry in this on-going series which has become one of my all time favorites. Now to get my hands on CIRCLE OF SHADOWS and find out what happens next. Why this series isn't making splashier news in this country can be blamed on the odd publishing sequence and the scarcity of books which often have to be purchased directly from England. Author Imogen Robertson does her research but not so you'd notice great blocks of info being tucked into the manuscript. Instead it's all slight of hand and very well done. These are stories which have the definite flavor of their time but written with a modern day sensibility. It helps if you're interested at all in English history, but it's not a requirement. Sounds intriguing, Yvette - I may have to try one. (The TBR pile sways unhappily... ;-) I do like some historicals, and it's an interesting period in English history. I just picked this one up at the library myself, and can't wait to begin it......love this series. You really should, Les. If you have any interest in historical mystery you can't go wrong with this series. It is topnotch. Me too, mjoy. Me too. Well, you can tell that - right? I can't wait to read the next one. This sounds right up my alley! I am going to look for this series. This sounds like a great mystery series - how have I missed it so far? Thanks for bringing it to my attention! It's terrific, ShaReKay. I hope you like it. Debbie, all I can say is, I love it. I hope you will too. Yvette, I like reading historical fiction, including mysteries, and your review strongly suggests that I ought to get acquainted with Imogen Robertson's books. I don't think I have read any modern-day novels set in the 18th century. I hadn't either, Prashant. The setting is one of the attractions of this series for me. But it's the fine writing that keeps me coming back. I have not even thought of this series before, so I think this just went on my wishlist. Just started Island of Bones (audio versions of Robertson's books are wonderful) after reading the others. Gabriel Crowther and Harriet Westerman are intriguing, well-crafted characters. Excellent series! Such a treat to find other Imogen Robertson fans! I picked up this book for dad who is 87 at the local library. He is asking me what a Vizegrafin is??????? Any info would be appreciated. It appears to be the German equivalent of Viscountess. The woman in the book was the widow of some minor non-English noble. It is an old title name having something to do with the Holy Roman Empire. Or so I gather from some brief research I did.